Wow! 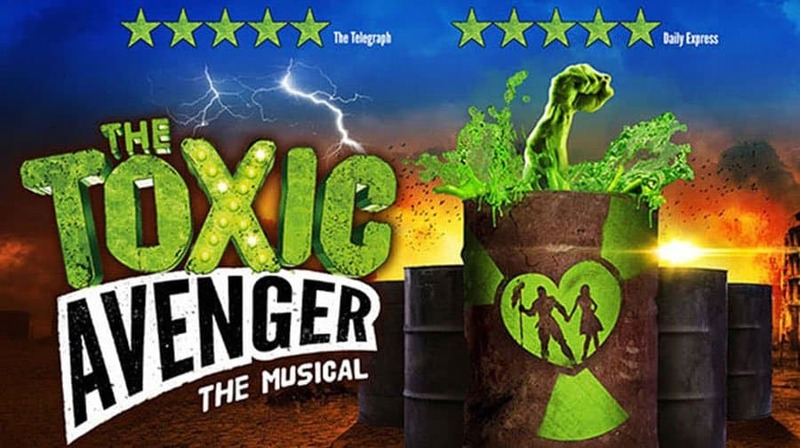 Benji Sperring’s production of David Bryan and Joe Di Pietro’s musical The Toxic Avenger has come a long way since I furst saw it in a short season at the Southwark Playhouse. Not only has the show been beautifully adapted for a proscenium arch stage but here it has been brilliantly captured on film to be enjoyed again and again by subscribers to Broadway HD. Based on the iconic Troma film character, Melvin / Toxie sets out to save the citizens of New Jersey from a Lady Mayoress determined to line her pockets with cash accumulated from the illegal dumping of toxic waste. Hope comes in the form of a toxic mutant and a blind librarian who pit their forces against a plethora of character creations from a cast of five hundred, no make that just five! Directed for the screen by Nick Morris, this is a production dominated by designer Takis’ pipes full of luminescent green toxic ooze, brilliantly lit by Nic Farman. Sperring and choreographer Lucie Pankhurst uses every inch of the Arts Theatre stage to niftily stage this pageant of good versus evil. Their cast of five seeming like a veritable small army of actors, the range of Natalie Hope, Che Francis and Oscar Conlon-Morrey in particular are quite incredible. Tongues planted firmly in their cheeks you just never know what they might get up to next. Emma Salvo is in blistering comic form as Sarah, the blind librarian. It’s a performance that transfers brilliantly to the screen and had me aching with laughter. Of course, it’s about as politically incorrect as you can possibly imagine, but for the country that gave birth to Carry On it is embraced and gives rise to some of the funniest moments I’ve seen on stage in a musical in recent times. As Mevlin and Toxie, Ben Irish comes across equal parts geek and transformed hero in this laugh a minute musical. Irish and his fellow cast members are in perfect synch throughout. It’s obvious they are having a ball on stage and the infectious fun that ensures radiates throughout the theatre and indeed onto the screen. Bryan and Pietro have brilliantly structured The Toxic Avenger and created some of the catchiest songs to drive along this comic juggernaut of a show. Each number is delivered will full force bravado by the cast backed by Alex Beetschen’s on stage band. It would be great to see The Toxic Avenger permanently situated in a West End Theatre like the Arts Theatre (we certainly need more venues to house shows like this over longer periods) , but if that can’t be, this great filmed version now available on Broadway HD is the next best thing. I’ve already watched it a number of times and there’s always something new to see as Sperring’s production unfolds into a comic tour de force.